If, like this reviewer, you are a fan of Van Plexico’s star spanning superhero saga, The Sentinels, then the arrival of this book, the eight in the series, was a much anticipated reading pleasure. Of course with this many volumes into the saga, it would be impossible for any reviewer to explain everything without having to write a book-length tome about what has gone before. Here’s a thought, as we’ve had the fun of reading and reviewing the previous seven books, feel free to scroll through our reviews and find those early critiques. Otherwise, leave us offer up an abbreviated synopsis to launch you into this truly amazing series whose inspirations derive from the classic comic books of the 70s and 80s, specifically Marvel’s the Avengers and Guardians of the Galaxy with DC’s Green Lantern. 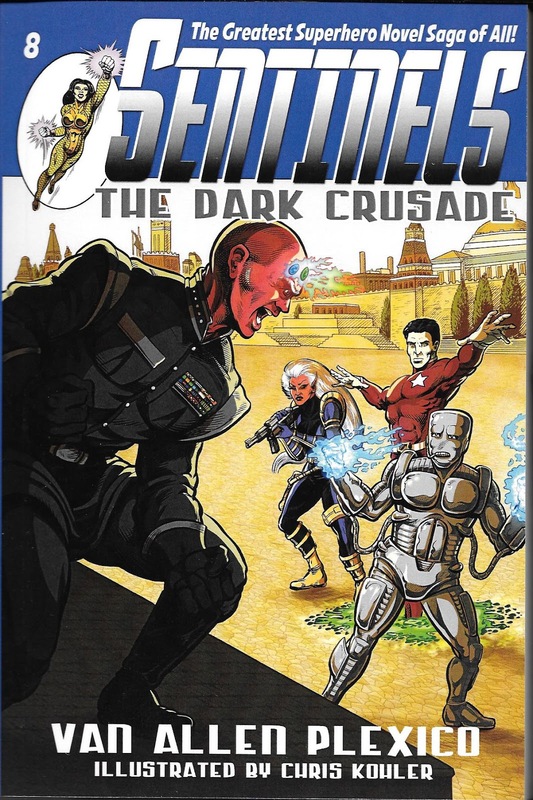 The Sentinels are a group of human super powered heroes led by Ultraa. In recent adventures they battled invading alien beings and ultimately came to ally themselves with a squad of Kur-Bai warriors known as the Elites. No sooner do they save the Earth, then it is discovered a civil war has broken out on the Kur-Bain homeworld and the Elites are compelled hurry back. Only now half the Sentinels agree to accompany them, led by Esro Brachis, the millionaire genius inventor, who has fallen in love with the beautiful Kur-Bai Captain Mondrian. No sooner to they depart our solar system, then a charismatic fellow named Law convinces the Earth’s governments that the Kur-Bai Empire will remain a continuing threat unless a human led space armada can be sent against them; under his leadership of course. What the world leaders don’t know is that Law is actually a powerful super being known as the Black Terror and his desire to destroy the Kur-Bai is fueled solely by a personal vendetta. Thus the ominous crusade referred to in the title. Now if this dozen or so characters wasn’t enough to hold your interest in the main plot, Plexico throws a little background history concerning the martial arts fighter known as the Black Dragon and then brings us up to speed with the situation concerning teenage hero Mitch Michaelson, who now possesses the powerful golden armor of a Star Knight. Confused yet? Well, in all truth, you needn’t be; ever. Plexico’s enthusiasm for the stories he tells has never once waned. From the very first Sentinel novel to this new chapter, his love for these myriad characters remains as strong as ever, infusing his fiction with a clear, precise storytelling economy that is to be envied. He tells a truly fast paced adventure that never slows down from opening scene to climatic, cliffhanger finale. And as ever, we are left wanting more, much, much more. We love this series, Plexico’s writing, and the gorgeous art of Chris Kohler. Honestly, if you call yourself a fan of New Pulp and haven’t latched onto The Sentinels Saga yet, you are missing out on something special. Don’t say we didn’t tell you. This is the second Carpenter & Quincannon mystery we’ve had the pleasure of reading and are eager to point you in its direction. Authors Marcia Muller and Bill Pronzini are both accomplished and cherished mystery scribes whereas how this series allows them to merge their considerable talents is a pure delight. We wonder if each, alone, actually crafted their respective gender avatars in the stories. Both the former Secret Service Agent Charles Quincannon and the widowed Mrs. Sabina Carpenter are terrific characters and their pension for solving complicated, criminal cases makes them unstoppable as a team. They operate out of San Francisco, where they have their offices, at the turn of the century. In this book, the bodies of two very different, and equally important, personages have been stolen. The first corpse mysteriously taken belonged to a high ranking Tong mobster in Chinatown. The ghoulish theft has the potential of igniting a bloody war between the rival gangs unless the perpetrators can be caught and brought to justice. When a young woman hires Quincannon to locate her heroin addicted husband, a lawyer for one of the Tongs, he has to venture into twisted mazes of the opium dens. No sooner does he find the missing husband than the man is shot to death in his arms, the detective barely avoiding a second bullet meant for him. Somehow the lawyer’s murder is related to the missing corpse. Then, a few days later, Sabina is hired by a wealthy upper-crust widow whose financier husband recently passed away. Shortly after his interment, unknown parties managed to break into the family mausoleum and kidnapped the body. Now they are holding it for ransoming. If she refuses to pay, they threaten to desecrate her beloved’s remains. The bodies of two prominent men from totally different social circles are snatched within days of each other. Coincidence? Or is there an actual connection between the two? Once again Muller and Prozini offer up a fast paced adventure with some of the most colorful characters to ever grace the pages of a mystery novel. 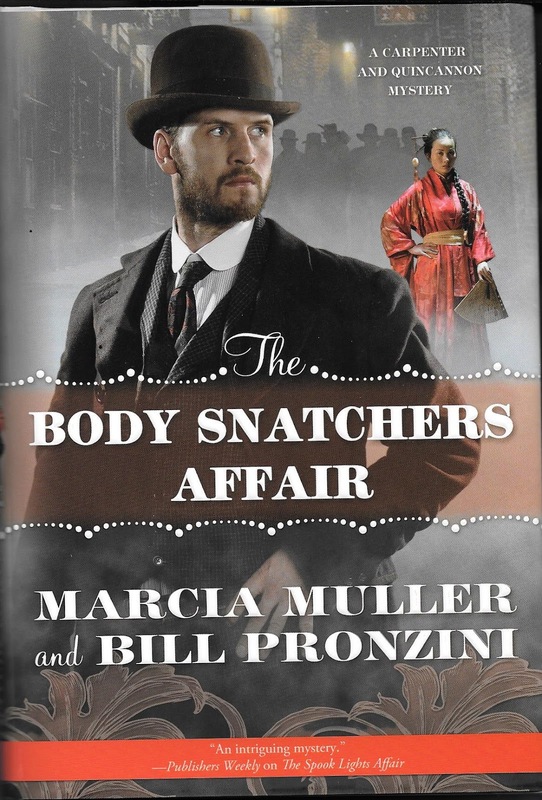 “The Body Snatchers Affair” is twisty romp that will easily satisfy even the most jaded reader. Personally, we can’t wait to see what this duo tackles next.